ONE of the most dramatic records of Divine intervention in history is the account of the Hebrews’ exodus from Egypt. The subsequent drowning of the entire Egyptian army in the Red Sea was not an insignificant event, and confirmation of this event is compelling evidence that the Biblical narrative is truly authentic. Over the years, many divers have searched the Gulf of Suez in vain for artefacts to verify the Biblical account. 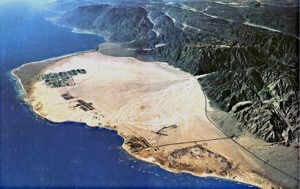 But carefully following the Biblical and historical records of the Exodus brings you to Nuweiba, a large beach in the Gulf of Aqaba, as Ron Wyatt discovered in 1978. 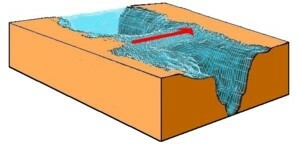 Repeated dives in depths ranging from 60 to 200 feet deep (18m to 60m), over a stretch of almost 2.5 km, has shown that the chariot parts are scattered across the sea bed. Artefacts found include wheels, chariot bodies as well as human and horse bones. 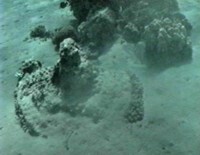 Divers have located wreckage on the Saudi coastline opposite Nuweiba as well. 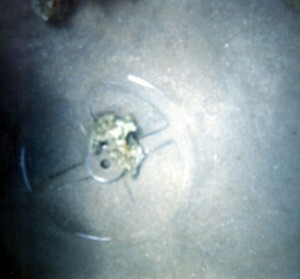 Since 1987, Ron Wyatt found three 4-spoked gilded chariot wheels. 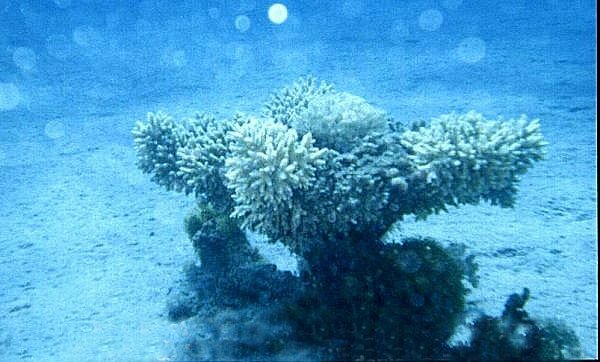 Coral does not grow on gold, hence the shape has remained very distinct, although the wood inside the gold veneer has disintegrated making them too fragile to move. 2. Mineralised Bone – One of many found at the crossing site (above centre). This one Tested by the Dept. 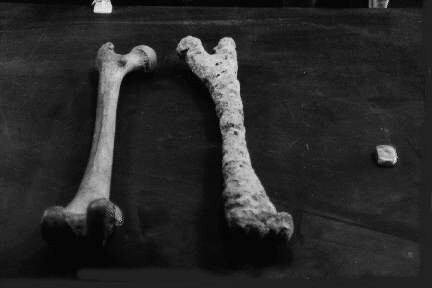 of Osteology at Stockholm University, was found to be a human femur, from the right leg of a 165-170cm tall man. It is essentially ‘fossilized’ i.e. replaced by minerals and coral, hence cannot be dated by radiocarbon methods, although this specimen was obviously from antiquity. 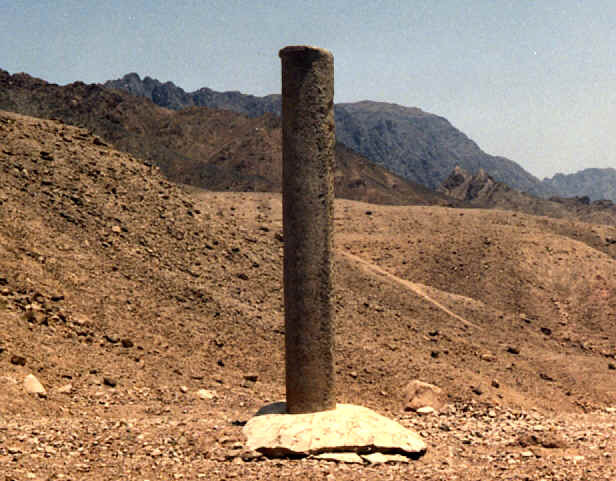 WHEN Ron Wyatt first visited Nuweiba in 1978, he found a Phoenician style column lying in the water. Unfortunately the inscriptions had been eroded away, hence the column’s importance was not understood until 1984, when a second granite column was found on the Saudi coastline opposite — identical to the first, except on this one the inscription was still intact. 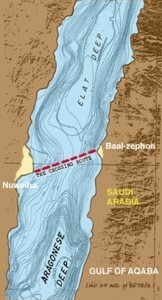 In Phoenician letters (Archaic Hebrew), it contained the words: Mizraim (Egypt); Solomon; Edom; death; Pharaoh; Moses; and Yahweh, indicating that King Solomon had set up these columns as a memorial to the miracle of the crossing of the sea. Saudi Arabia does not admit tourists, and perhaps fearing unauthorized visitors, the Saudi Authorities have since removed this column, and replaced it with a flag marker where it once stood. THE Gulf of Aqaba is very deep, in places over a mile (1,600m) deep. Even with the sea dried up, walking across would be difficult due to the steep grade down the sides. But there is one spot where if the water were removed, it would be an easy descent for people and animals. This is the line between Nuweiba and the opposite shore in Saudi Arabia. 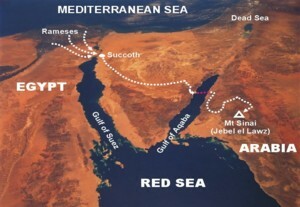 The Bible writers frequently refer to the miracle of the Red Sea crossing, for it was an event which finds no equal in history. The Hebrew prophets describe the sea at the crossing site as “…the waters of the great deep …the depths of the sea…” (Isaiah 51:10).